Marvel fans in the know have been aware for a while now that this month’s Guardians of the Galaxy #18 is going to reveal the fate of Richard Rider, better known as the hero called Nova. With the wild success of the Guardians film, and the foreknowledge that Rider’s fate would be explained, I recently took a tour back through the now classic Abnett and Lanning run of 2007 to 2011, to remind myself of just how awesome those cosmic cops in the Nova Corp can be (especially after their portrayal in Guardians that left them feeling more like cosmic Keystone cops–perhaps the only let down of the film for me). Click below the fold for more on the under-sung fan favorite, Nova. While I’ve been a Richard Rider/Nova fan since the early nineties gifted us with that quintessentially nineties title, the New Warriors, Nova truly flourished in the early aughts, when Marvel was diligently re-crafting their cosmic titles cosmology. Amid all that freaky deeky space stuff, Richard Rider felt like a true every man kind of character, who was simultaneously a part of and apart from the weirdness. At no point is this better captured than early in DnA’s Nova run when Rider returns to earth for a brief respite from the life of endless cosmic warfare that inheriting the mantle of Nova Prime had resigned him to. Upon arriving, he discovers a world very different than the one he left–a world wracked by super-powered Civil War, and a family that assumed he was a casualty of the tragedy that launched it. The amazing thing about that plot arc isn’t the random factor that the return of Nova potentially injects into conflict between Steve Roger’s rebels and Tony Stark’s Initiative, but how Richard Rider struggles to deal with it, which he ultimately does in a very human way: by leaving Earth for good. Though Nova ran for many issues after that pivotal moment, Rider’s retreat into space and re-commitment to his responsibilities as Nova Prime–to continue combating the cosmic threats that no one else was equipped to tackle–could be seen as the beginning of the end for Mr. Rider. 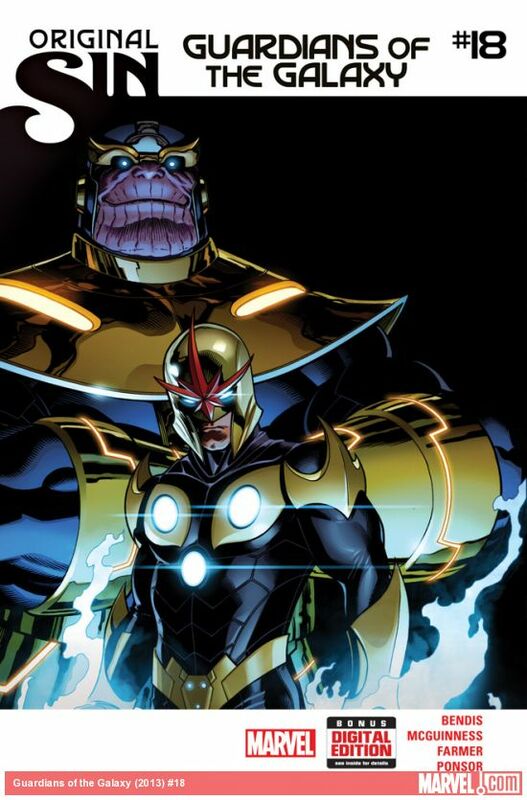 Those long battles culminated in an event called the Thanos Imperative, which left both Nova and our beloved Star-Lord in an appropriately-named dimensional backwater called the Cancerverse, lost and presumed dead… only for Star-Lord to re-emerge at the dawn of Guardians volume 3, with Richard Rider nowhere to be found. And then came Sam Alexander. We don’t talk about Sam Alexander. Now, as Original Sin reaches it’s culmination, Richard Rider’s fate is to finally be revealed. I can help but anticipate what Marvel has in store for their returned hero, and whether this singular issue will simply provide closure, or serve as new beginning for our old friend Nova. Certainly the teaser image posted above doesn’t bode well, with a smug looking Thanos and a Nova who looks like he’s about to throw down on the Mad Titan’s behalf. Which begs the question: who knows what kind of bargain Star-Lord or Richard might have struck to escape the Cancerverse? For my part, I’m hopeful to see Richard Rider restored, even if that means that Sam Alexander becomes his sidekick or something, to appease Sam’s fan. Only a week before we have resolution to this multi-year mystery, and it’s going to feel like an eternity. Guardians of the Galaxy #18 hits shelves on August 27th.